While I'm working on the next prospect write-up, I thought it would be fun to post a quick hitter on a potential breakout candidate for 2013. No, he's not a Red, but I stumbled across Rick Porcello's career stats and couldn't help but notice that he shared some of the same trends in his peripherals that made me think 2012 could be a breakout season for Homer Bailey. 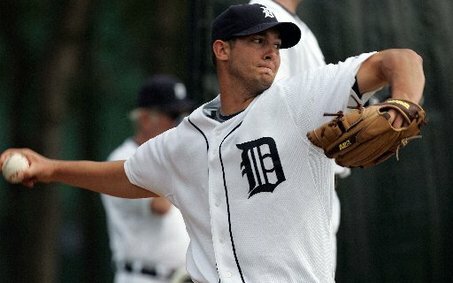 Porcello has always had good control and has maintained it throughout his MLB career. F-Strike% is the percentage of batters that the pitcher starts off with a first pitch strike. Major League average is 59%. It's an important metric for the simple fact that getting ahead in the count permits the pitcher to tilt the probability of success in his favor. Porcello has been gradually trending upward, showing improved command inside the strike zone. In 2012, Rick posted the highest SwStr% of his career, which is encouraging given the correlation between swing-and-miss strikes and strikeout rate. Obviously, a strong strikeout rate is important to dominating pitching and Porcello posted the highest strikeout rate of his career in 2012. IFFB% is the percentage of fly balls that stay on the infield. Infield fly balls are valuable because they are the most automatic out among the different types of balls in play. If a pitcher isn't going to get the strike out, then the infield fly ball is the next best outcome. Surprisingly (as I wouldn't necessarily expect this to be within the pitcher's control), Porcello has shown significant improvement each and every year in generating infield fly balls, which minimizes the potential damage caused by allowing contact. And, of course, ground balls are always desirable, as they rarely go for extra base hits. If a pitcher can keep the ball on the ground, then the chance that the hitter will earn extra bases is diminished. Porcello has been driving his ground ball/fly ball ratio down over the last few seasons. Overall, Porcello is showing similar trend lines in his peripherals to those preceding Homer's step forward in 2012 and while he isn't flashing quite the same the dominating stuff that lifted Homer to new heights, he's also showing improvement in his ball-in-play peripherals. It's easy to dismiss a one year spike in performance, but when a pitcher demonstrates incremental improvement in performance on an annual basis it becomes much more difficult to dismiss. If I was a gambling man (and I'm not), then a step forward by Rick Porcello wouldn't be a sucker bet. One factor that potential cuts against a step forward by Porcello is the Tiger team defense, especially on the infield, which won't exactly be a boon for higher contact pitchers like Porcello. On the other hand, he also gained valuable postseason experience, including a nice turn in the World Series, which can only help his confidence. I'll be curious to see how all this shakes out in 2013. I'm expecting good things, including a spike in strikeout rate and an overall step forward, from Rick Porcello. If the Reds actually needed starting pitching (and seriously, how bizarre is it that they don't??? ), then I'd be advocating that they make a play for him.